On potato pizza I recently heard from her son. In our school the lessons of technology are the basics of cooking and teaching children to cook. So, the lesson of cooking my baby cooked potato pizza. And he liked it very much. He wanted to somehow repeat the pizza with me at home. And here is the reason to found -Hellouin and competition on our site. So we decided to play pranks). The basis of the recipe have potato pizza that kids are doing in school. But in addition to design, I made more adjustments to the cooking of the potato cake. 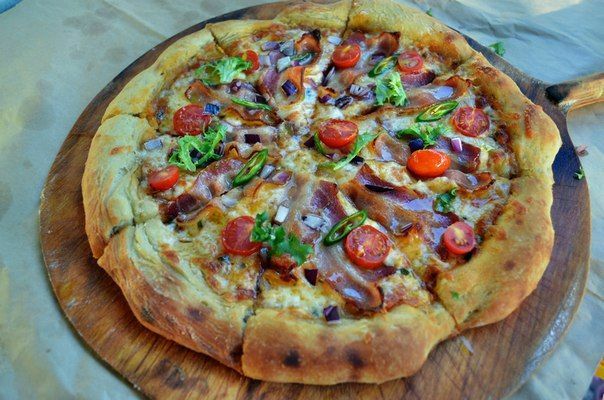 This pizza is perfect for «Sabbath»)). It is nourishing, tasty, fun and a little scary)). So the first thing is to boil the potatoes. I decided to cook the potatoes in their skins. So it will be tastier. Prior to this, thoroughly wash the potatoes. Once the potatoes are cooked, it is necessary to peel while still warm. Add the salt to taste and a little butter. Crush tolkushkoy to a state of mashed potatoes. Add to mashed egg. See to it that there was no hot sauce to the egg is cooked. Mix well. Now Spoon sauce into a greased form (I sectional), which will be baked. Smooth. It is possible in principle to make potato pancakes right on protven. Lubricate ketchup. I have quite a bit of grease, because my child is not a fan of ketchup). The next layer — cheese. I used two kinds of cheese. Cheese should be grate. Bell pepper (any color), wash and cut into thin strips. From these strips to lay on a layer of cheese cobweb over the entire surface. Now we take dogs and masters of their fingers)). For more credibility, I took Viennese sausages because they are thinner. One sausage enough for 4 fingers. Sausages cut first in half crosswise, then lengthwise. We do fingernails cheese. Cheese is necessary to use a solid, then it will retain the shape of the oven and raspolzetsya. Cheese knife cut the nails and put on round the ends of sausages. More needs to be done by two shallow notch closer to the cut edge. This will be an imitation of the folds of the skin). 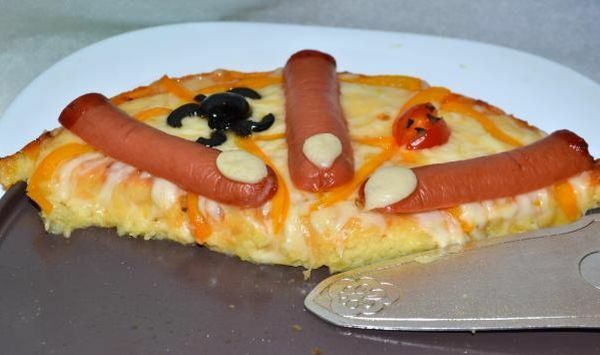 Sausage lay on a pizza. And now we are going to do a vampire mouth of cherry tomatoes and olives. To do this, cut the tomatoes in half. Then, in each half slice cut out of the center (1/3 of the half). It got this figure, which resembles an open mouth. Pulp remove with a knife. Olives cut into small pieces that resemble teeth. The walls of the tomatoes with a knife to make cuts (as pockets) and paste to the teeth of the olives. Here’s a mouth we turned. From a cherry get 2 pieces. We have three). 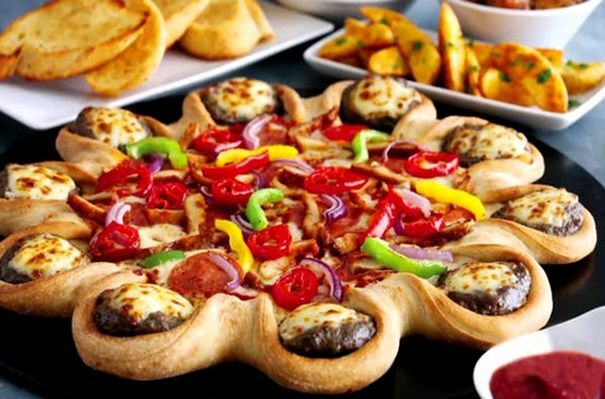 Arrange vampire mouths of pizza. So we decided the whole thing still bugs and spiders complement of olives. Maslinka cut in half. One half — body, a second cut semicircles. It will be the foot. Putting spiders directly on the pizza. We put our pizza in a preheated 220 degree oven for 15-20 minutes. Here’s a nightmare we got a pizza)). The edges of the sausages I have smeared ketchup, simulating the blood). Chunks easy enough to lay out a shovel, even when pizza is still very hot.